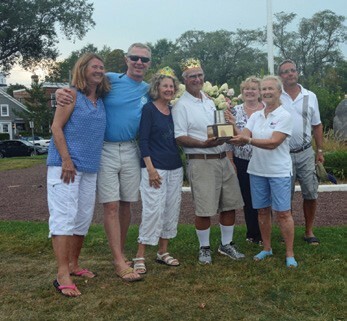 Shoreline Sailing Club’s Roger Potkin of Uncasville, CT and his crew of Sandy Walsh, Mark Greenfield and Karen Mooney sailed his Catalina 34 Camelot to victory in the annual Sag Harbor Labor Day Weekend Race, known as the Bud Cook Memorial Race. Cook and his wife Vilma were very active members of the Shoreline Sailing Club, and he served as Commodore for three years in the 1980s. He passionately competed in the Sag Harbor Race each year, winning many trophies. After Bud’s death from cancer in 2008, Vilma asked for the race to carry his name since it always meant so much to him to win it. He and fellow club member Jack Lombard were fierce competitors in the races. An expert sailor for 55 years in competition and cruising, Bud sailed the Bahamas as far south as the Tropic of Cancer as well as every state from Maine to Florida. 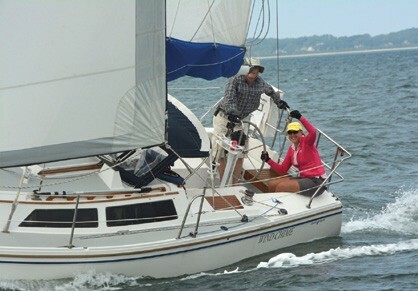 He and Vilma met as part of a sailing group that was later transformed into a formal club with bylaws, the Shoreline Sailing Club, for singles age 35 and over. The couple got engaged and after they married, thought they would have to leave the singles sailing club. However, he came up with an idea that was put into the bylaws: couples who meet as club members and later marry can be auxiliary members. A Clinton resident, Vilma remains a club member and personally presents trophies to the race winners each year. Finishing in second place in the Bud Cook Memorial Race was Ted Geiger of Old Saybrook, whose Que Sera Sera had an all-female crew. A sailor and racer since he was 12, Geiger bought his boat just three weeks prior to the race and now lives aboard. Third place was claimed by Bob Lattanzio’s Got Wind? (Lisbon, CT). In September, Shoreline Sailing Club members also participated in the 44th Annual Newport International Boat Show in Newport, RI, the Connecticut Maritime Heritage Festival in New London, CT, and the Greenport Maritime Festival in Greenport, CT. They wrapped up the active sailing season on Columbus Day weekend with a daysail at Hamburg Cove in Old Lyme, CT.
Shoreline Sailing Club’s Roger Potkin holds the trophy he won in the annual Bud Cook Memorial Race. To his right is Vilma Cook, who presented him with the trophy. From left are crew Karen Mooney, Mark Greenfield and Sandy Walsh. At far right is Bob Lattanzio, last year’s winner and this year’s third place finisher. Shoreline Sailing Club’s activities don’t end there. Meetings are held year-round on the first and third Thursdays of each month at 7:30 pm at the Westbrook Elks Lodge, located at 142 Seaside Avenue in Westbrook, CT. Other social and recreational activities include trips, dances, hikes, theater events, dinners, brunches and an annual outing for newcomers. Members pay annual dues plus event fees, and the guest fee for attending a meeting is $10. For more information, visit shorelinesailing.com.